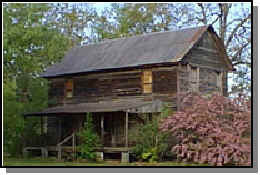 Most of Gwinnett's surviving plantation houses are built in the "Plantation Plain" style. Typically, these were two story houses, one room deep, with central hallways and gable-end chimneys. 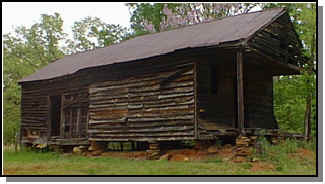 This was a common house style in the Georgia Piedmont during the settlement years. The houses included in this tour are typical of the plantation homes that dotted the countryside of Gwinnett in the 1800s. Today, less than 15 of these historic houses remain standing in Gwinnett. Unless otherwise noted, these properties are privately owned and not open to the public. Please respect the privacy of these property owners. Parking for photographs is available at the following locations only: the old Gwinnett County Courthouse, the Elisha Winn House, the Wynne-Russell House and Fairview Church. 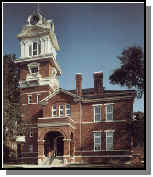 Present structure, 1885, replaced an earlier courthouse which was built in 1872. Several Historic Markers are on the square. On Clayton St. go .7 mi. to Hwy 20. Turn left go 1.5 mi. bear right on Hwy 124. Go .5 mi. Campground on left. 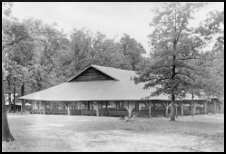 Annual Camp meetings are still held at this site. Continue on Hwy 124 4 mi. House on left past Old Peachtree Rd. This house has been donated to the county and has now been moved to the Gwinnett Environmental & Heritage Center. The exact building date and builder of this simple, weather-worn house are unknown. Benjamin Chesser, a veteran of the War Between the States, owned the house during the 1870s. One day, a German itinerant painter chanced upon Chesser's house. Chesser offered the man food and shelter and in return the artist set about painting Chesser's house. As a result, the Chesser-Williams House is now adorned both inside and out with delighfful artistic touches, including grain painted doors, false wainscoats, stencils, and a framed country landscape painted right onto the wall boards. Since being moved, the outside has been restored and the inside is in the process. Continue on Hwy 124 1 mi. Marker on right before intersection of Hwys 124 and 324. Continue on Hwy 124 .2 mi. Turn right on Hwy 324. Go 1.9 mi. Turn right on Dacula Rd. Go .6 mi. House on left. 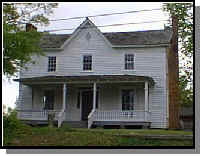 The Winn House is historically significant for Gwinnett County for it served as the County's first Courthouse. 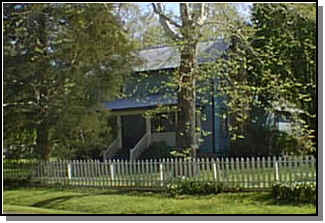 Inferior Court and the County's first elections were held in Winn's House while the Superior Court met in his barn. A small jail was erected near the barn to house prisoners of the court. Courts were held at this site for just over a year, until the county had been surveyed and divided into land lots and Lawrenceville became the county seat. 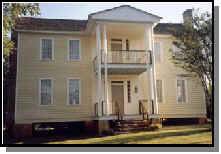 The Winn House is listed in the National Register of Historic Places and a Georgia Historic Marker is located at this site (paid for and installed by GHS.) The Winn complex also includes an 1870s one-room school, which was relocated to this site in 1986. The house and grounds are open the first weekend of October for the annual Elisha Winn Fair. For more information [click this link] or call the Gwinnett Historical Society (770) 822-5174. Continue on Dacula Rd. 2.2 mi. At the intersection, turn left onto Fence road and go .2 mi. Cafe 313, inside the Hinton House, is on your left. This turn-of-the-century home was built in 1905 by Dr. William Hinton. 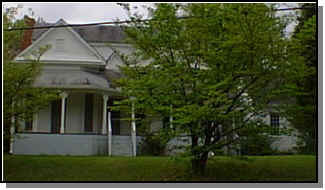 The house was originally located at the corner of Fence and Dacula Roads but was moved to save it from encroaching development. The house is open to the public as Dr Hinton's great granddaughter, Teresa Hinton Cantrell, now operates Cafe 313 here. After leaving the Hinton House, come back to the intersection and turn left and continue on Dacula Rd. 2.0 mi., crossing Hwy 29 and Hwy 316. Turn right on Alcovy Rd. Mill on right at river 2.2 mi. Last workable water-powered mill in the county. Privately owned. Continue on Alcovy Rd. .9 mi. to a dead end. Turn right on Martin/Sweetgum Rd. Go 1 mi. to dead end. Turn left on Hwy 29 and go 1.7 mi. Turn left on Hwy 124 and go 4.3 mi. Turn right on Webb Gin House and go 2.2 mi. Turn right on Dogwood Rd. and go 1 mi. and turn left on Five Forks Trickum Rd. Go 1.1 mi. House on left, store/P.O. on right. Thomas P. Hudson served in the Georgia General Assembly 1853-54, 1855-56, and 1861-62. He was one of Gwinnett's three delegates to the secession convention in Milledgeville where the State of Georgia resolved to withdraw from the Union. Although he opposed secession, once the war began he supported it wholeheartedly. Records from 1860 indicate Hudson owned 562 acres. His is one of the few plantation houses remaining in Gwinnett with its detached kitchen still intact. Hudson was a farmer. He also kept a general store and the Yellow River Post Office in the small wooden structure directly across the road from his house. Hudson was postmaster here from 1846 until his death in 1862. Gwinnett County was given the Post Office and surrounding land in 1997 to preserve and restore. The house is privately owned and not open to the public. Continue on Five Forks Trickum Rd. 1.5 mi. Turn left on Killian Hill Rd. Go 2.7 mi. When you cross Hwy 78 the road name changes to Bethany Church Rd. Go 2.7 mi. to Hwy 124. Turn right. Go .7 mi. and turn left on Centerville-Rosebud Rd. Go 1 mi. Turn right on Mink-Livsey Rd. Go .6 mi. House on left at Caleb Rd. Charles Livsey was born in Georgia in 1820. He married Rebecca Bryan and the 1870 Gwinnett Census shows 7 children living in their household, six boys and one girl. At Charles Livsey's death in 1891, he bequeathed to his wife, Rebecca, their house and sixty acres and his mule and buggy. The remaining property was divided among their children. When Rebecca died in 1902, the land passed to their oldest son, Green H. Livsey. Green was named for his grandfather, a veteran of the War of 1812 and an overseer for 2 years on the plantation of Robert Toombs. Privately owned - Not open to the public. Continue on Mink-Livsey Rd. 1 mi. to Lee Rd. Turn right. Go 2.2 mi. to dead end at Anderson-Maguire Lane. House on left at the intersection. In 1860, Thomas Maguire's plantation, known as the "Promised Land," encompassed nearly 1,000 acres. Maguire kept a series of journals describing life on the plantation. A surviving diary, which chronicles the years 1859-66, tells of growing cotton, wheat, corn, vegetables and fruit, and raising hogs, cattle, and sheep. Activities on the plantation included carpentry, blacksmithing, ginning, tanning hides, milling flour, grinding cane, and making brick. Maguire's journal also records the effects of the War Between the States on his plantation and the Atlanta area. In November of 1864, Yankee soldiers on their "March to the Sea" passed by the Promised Land and burned Maguire's gin house, stables, barn, and fences while Maguire hid out in the woods. The soldiers also stole or slaughtered his livestock. Fortunately, Maguire's house was spared and stands today in Gwinnett's Promised Land Community. Privately owned - Not open to the public. Turn left on Anderson-Maguire Lane. Go to Hwy 124. Turn left, and continue 1.5 mi., crossing DeKalb County line. Turn right on S. Rockbridge Rd. Go .6 mi. House on right before Juhan Rd. Elijah and Celia Anderson married in Putnam County, Georgia, in 1810, and moved to Gwinnett in the 1820s. Celia died not long after the move and when Elijah passed away in 1840, their youngest son, David, inherited their land in the Rockbridge District. David married Edney Minor and they had 13 children, six of whom died in infancy. By 1860, David had a prosperous plantation of 670 acres. The Andersons built a complex here called "Pleasant Valley." 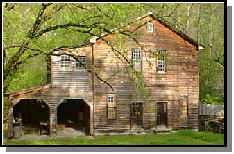 It consisted of a church, general store, cabinet shop, blacksmith shop, cotton gin, grist mill, and planing mill. David's sister, Jane, married Thomas Maguire. Following Jane's death from blood poisoning in 1837, Maguire married another of David's sisters, Elizabeth. Privately owned - Not open to the public. Continue on S. Rockbridge 2 mi. Turn right at intersection with N. Deshon Rd. Go .1 mi. to Rockbridge/Annistown Rd. Turn left, then right at .1 mi on Stone Drive. Go 1.3 mi. Turn right on Hwy 78. Go 1.8 mi. Turn left on Killian Hill Rd. Go 6.1 mi., crossing Five Forks Trickum to Lilburn. Turn right on Hwy 29. Go .1 mi. Turn left on Wynne-Russell Dr. House on right at .1 mi. Thomas Wynne was born in Sussex County, Virginia in 1788. He volunteered for the War of 1812 in Greenville, SC, and there he married Mary Prince Benson. By 1826, with seven children under nine years of age, they moved by covered wagon to Gwinnett County. Seven more children were born in this house. When Thomas died in 1839, his widow had nine children under the age of 18 to raise on the 500-600 acre plantation. 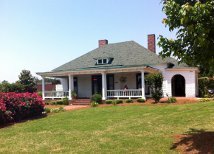 The Wynne-Russell House has been restored by the Lilburn Women's Club and is listed in the National Register of Historic Places. For more information, contact the City of Lilburn (770) 921-2210. Continue east on Wynne-Russell Dr. .6 mi. Turn left at Hwy 29. Go 6.2 mi. Marker on left in Davis Mill Shopping Center. Go back on Hwy 29 W .6 mi. Turn left on Patterson Rd. Go 1.5 mi. Turn left on Five Forks Trickum Rd. Go .7 mi. House on right. Robert Craig is considered one of the most successful planters that ever lived in Gwinnett County. He and his wife, Nancy Adair, came from South Carolina around 1821 and settled on the old Stone Mountain Road (present day Five Forks Trickum). Craig worked hard, lived frugally, and accumulated a large estate. 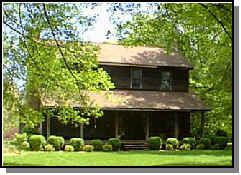 At its height, the Craig plantation stretched ten miles across the county. According to local legend the plantation got its name "Little Egypt" as follows. During the War Between the States, Craig knew hard times were ahead and so, like Joseph in the Old Testament of the Bible, he stored up his grain. The grain was hidden in the woods near a creek to protect it from Yankee foraging parties. After the War was over, people came from as far away as Tennessee, and other neighboring states, to buy Craig's grain and cotton seed to start their lives over. Privately owned - Not open to the public. Continue on Five Forks Trickum .2 mi. to Sugarloaf Parkway. Turn left. Go 1.3 mi. to Lawrenceville-Suwanee Rd. Turn right. Go 2.8 mi. crossing Hwy 29 and Old Norcross Rd to Pike St. (Hwy 120). Turn Right go .2 mi. Turn left on Lawrenceville Market Dr. Church on Left. Although this church has been renovated over the years, it still sits on its original rock pier foundation. 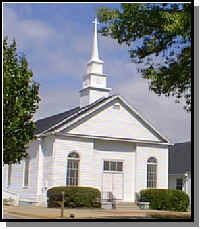 Fairview is the oldest church standing in the county. Many of Gwinnett's early settlers are buried in Fairview Cemetery. Turn right out of church parking lot onto Lawrenceville Market Dr. Turn right onto Hwy 120. Go 1.8 mi. to Sever Rd. Turn right. Go 2.5 mi. to dead end on Old Peachtree Rd. Turn left. Go 1.3 mi. House on right. Mary Ann Roach came to America in the late 1700s as a stowaway on an Irish freighter. In Philadelphia, she met and married John C. Goodwin who was also an Irish immigrant. Records from around 1800 show the couple living in Rutherford County, NC and having five children. 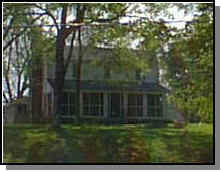 A son, Joseph, acquired this property in Gwinnett Co. in May, 1835 from his father-in-law, William T. Graham. The house was already standing. The exact date of construction and the builder are unknown. When Joseph's father died, his mother came to live with the couple in this house. Six generations of Goodwins have now lived in this fine old home near Suwanee. Its lovely heart pine interior has never been painted. Privately owned - Not open to the public. Turn around and take Old Peachtree Rd 1.1 mi. to I-85. Turn left onto I-85 North. Go 12 mi. to exit 120. Turn left onto Hamilton Mill Rd. Go .2 mi. to Sardis Church Rd. Turn right. Go .6 mi. to W Rock Quarry Rd. Turn left. House is on right. John Bowman, a native of North Carolina, volunteered as a courier for Andrew Jackson's staff during the Seminole Wars. In 1818, when the troops were resting in Hall County, Georgia, Bowman visited with his father's old friend Cherokee Chief Major Ridge, who was encamped nearby. 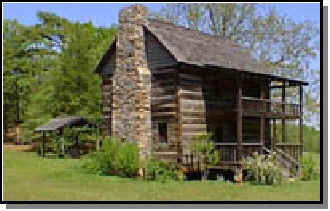 Major Ridge, knowing loss of tribal lands was imminent, gave Bowman 2,700 acres of land and sent four Cherokees to help Bowman construct this log house. Bowman acquired approximately 5,700 acres of land adjacent to this tract from winners in the Georgia Land Lottery of 1820. Over the years, he developed a magnificent plantation on his holdings in Gwinnett and Hall Counties. 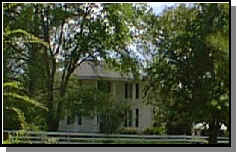 The Bowman house was moved to this site by Robert Bowman, a great grandson of John Bowman. Turn around take a right back onto Sardis Church Road. .6 mi. to Hamilton Mill Rd. Turn left, cross I-85, Go to Hwy 124 and turn right. Go 7.7 mi. to the intersection of Hwy 124 / Hwy 20. Turn left. Go 2.3 mi. to dead-end and turn right onto Pike St. go .1 mi. to Courthouse on left.